With the increased frequency of natural and un-natural tragedies in today’s world, the necessity for complete First Responder communications coverage has reached an all-time high. It has become increasingly more imperative that venues of all types and sizes assure cellular and public safety service throughout the building for both occupants and First Responders. In the event that a natural or un-natural event occurs in or around a venue, it is critical that both public safety and cellular coverage works. 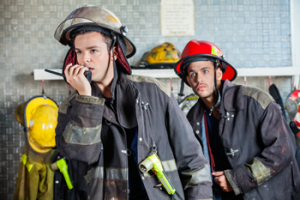 First Responders communications need to be able to take place inside the venue, but these First Responders must also be able to communicate with the outside command. On the other hand, building occupants need to be able to contact 9-1-1, family, and friends in the event of an emergency. In the past, it was common for cellular service to be designed and deployed to support 95% of the total building space – often leaving elevators, bathrooms, stairwells and other areas commonly used as refuge without service. Recent events have demonstrated the fallacy of this method and reinforces the importance that the common refuge areas have coverage. In order to ensure adequate in-building communications, it has become a common practice for local state and law enforcement buildings to demonstrate sufficient wireless First Responder communications. If the building in question does not inherently support these frequencies, then a repeater or an in-building wireless system is required. If designed and deployed properly, an in-building wireless system can support both First Responder signals and cellular service providers signals. Of the many tragedies that have occurred as a result of a lack of in-building communications solutions, positive movements have been made to ensure that these incidents decrease in frequency. Many states and/or municipalities have recognized the importance of First Responder communications and have passed ordinances requiring new building to demonstrate adequate signal coverage, battery backup, fire rated cable and enclosures, and alarming. In fact, the trend now is for the ordinances to include the same requirement for existing buildings and requiring a plan be filed within the next couple of years, ultimately requiring complete compliance within five years. The most commonly accepted standards are National Fire Protection Code (NFPA), specifically NFPA 72 2016 and the International Fire Code (IFC.) One of the roles of the Safer Building Coalition is to be a resource to help bring awareness and understanding to the codes and their enforcement. Learn more about joining the SBC by clicking here. Also be sure follow us on our Facebook page, Twitter (@SaferBuildings), and connect with us on LinkedIn.